Although it was a lot of fun in the beginning, I rarely submit our beers to competitions anymore. There was a point when I felt like judges’ feedback was the only place where I could get honest, constructive criticism, but now, with a large group of obsessed beer nerd friends, my options have expanded and the opinions of the judges no longer seem to hold as much weight as they used to. With the homebrewing world growing and more and more brewers interested in passing the BJCP exam and later judging, I also found it extremely frustrating when you received two contradictory judging scores and notes. That said, there is still one competition that I like to enter each year…the Puget Sound Pro-Am. Although the Pro-Am competition is initially judged according to BJCP guidelines, it differs from other competitions in that local breweries select beers of their choosing to be scaled up and brewed at their breweries. They don’t always select the top beer in each category and often they’re only looking for beers of a certain style. If they do end up selecting yours though, the commercially brewed version will most likely be submitted to the Pro-Am competition at the Great American Beer Festival in Denver. With the limited time and planning that we had, deciding on a brewing strategy for the competition was not a simple task. Granted that we had some beers on hand that we could submit, we wanted to brew a few beers specifically for the competition that we believed could give us a leading edge. One thing that helped define a strategy for us was to look at what the trends were last year. In years past, it seemed like whatever did well at the GABF would do well at the local Pro-Am the following year. Two of last year’s winning GABF beers included rye and the 1st place beer was an imperial red ale with rye (Red Velvet). Given that rye’s a unique enough ingredient to make a beer stand out, yet it’s still easy to work with and produces repeatable results (as opposed to spices or the like), it seemed like a good option to incorporate into a recipe. About a year ago, we brewed an imperial red ale that, as far as all our hop-forward beers went, turned out to be one of my favorites that we’ve produced. Incorporating rye into the recipe seemed only natural and when the recipe for Red Velvet was printed in the November issue of Zymurgy, it turned out that our own recipe was extremely similar (with the acception of the rye addition). With a few modifications to our imperial red ale recipe, we essentially were killing two birds with one stone. I guess only time will tell if it’s a smart move or not, but using a unique-enough ingredient like rye and mimicking a winning style from last year seemed like a strategy worth trying. Mash Additions: ½ gram per gallon Chalk, ½ g/g baking soda. Fermentation Addition (see notes): 6 grams gypsum, 2.4 grams Epsom salt, 3 grams table salt. 3/4/2011 – Made 1 liter starter of 1.035 wort. 3/5/2011 – Added 500 ml to starter. Doughed in at 158° and hit our 152° mash temp dead on. Added mash mineral additions and hit 5.2 pH. 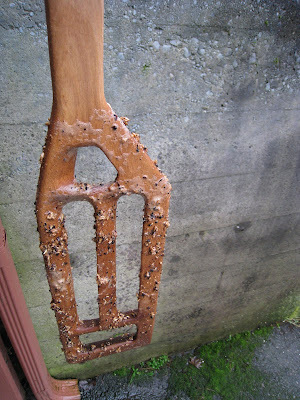 Rested for 60 minutes and then sparged until we had 7.5 gallons in the kettle with a total of 638GUs. Boiled for 90 minutes and with 15 minutes left, we added whirlflock and Wyeast yeast nutrient. Chilled down to 66° and racked beer into carboy. Started to oxygenate with tank 02 and airstone, but our tank was low so we only got about 10 seconds of 02 in there. After realizing this, we shook the crap out of the carboy for another 5 minutes. 3/7/2011 - Realized we didn’t add the boil kettle mineral additions, so we boiled up a cup of water and added the minerals that we would have added into the kettle. Water was cooled and then dumped into fermentor. 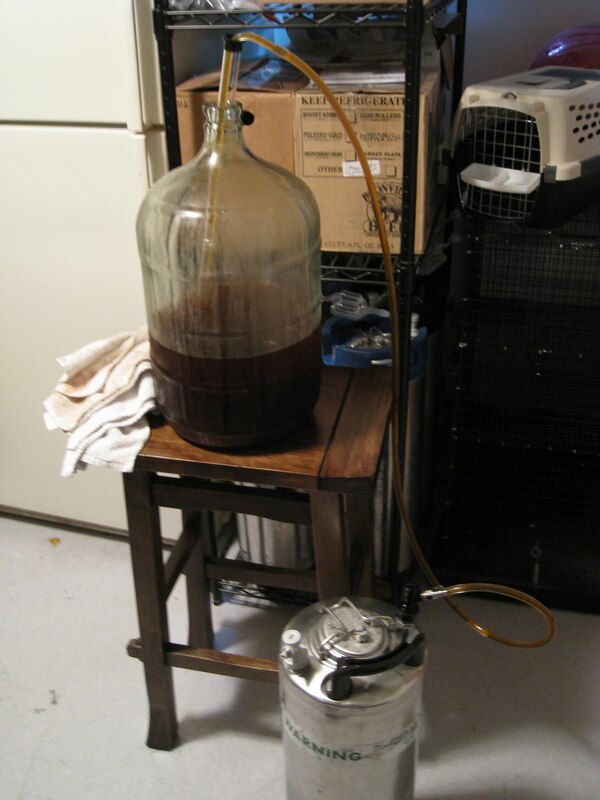 3/22/2011 – Needed the space in the fermentation chamber, so I brought the carboy up to my office. Ambient temp, ~70°. 3/23/2011 – Added dry hop additions to primary. 3/30/2011 – Wanted to get the beer off the dry hops, but since the beer was still very slowly fermenting, I transferred the beer to a C02 flushed carboy instead of kegging. 4/10/2011 – Kegged and carbonated to 2.6 volumes.